Back in January, the Brown Bag Sock Club was devised as a means to further reduce stash. 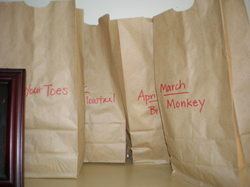 Four yarns and patterns were selected and placed in brown paper bags for future knitting. In the past couple of days, a number of people on Ravelry have started talking about receiving their first installments from various sock clubs. 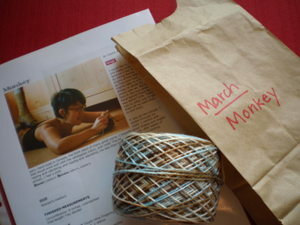 Time for me to open a bag...first up: March Monkey. For a long time last year, Monkeys seemed to be on everyone's needles except mine. What better way to kick off my personal sock club than with a pattern that's evaded my needles. 2007 was the year I fell in love with toe-up designs and Monkey was not toe-up. This particular pair is the first that has been on my needles top-down in over a year! Of course, the whole time I'll be devising a toe-up version, but for the inagural run (and since these will be for someone with small feet and I won't have to worry about running out of yarn) these are being knit as originally written. They will be "authentic" Monkey socks. The yarn is Scout's Snowbunny (merino/ tencel blend). 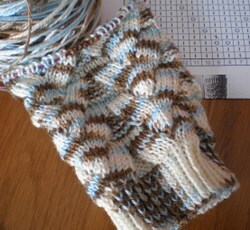 At first I worried about the pooling on the cuff, but not anymore...the random, non-striping is fantastic! And...the Monkey pattern...is totally addictive!!! One note about the Brown Bag Sock Club. I haven't looked into the bags since they were assembled. When March Monkey came off the shelf, I noticed that April Brigit is up next. Over the past couple of weeks, while knitting Brigit for the first time, it had slipped my mind that the pattern was already in another "queue". 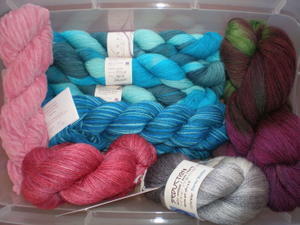 Now the thing is...I haven't a clue which yarn is in the Brigit bag! No cheating...just like a real sock club, we won't know what's in the bag until it "arrives".